So, we flew to Christchurch and met ‘Vera’. Although I had bought her just a few weeks ago, I have to confess, I was a little worried that I might have been sold a pup! It all happened so quickly. Nigel: There’s a camper van in CHCH, see if you can arrange to view. Anne: OK. Contacts vendors, they bring it to my hotel, I look around it. Test drive it around Christchurch on roads I don’t know, scared to go too far in case I get lost! Decide the vendors sound legit, WoF and history seems ok, bit tatty, but engine seems fine, drives ok. Deal done! Money transferred. 24 hours later, they deliver it to work. We are the owners of a 25 yr old Toyota Hiace camper van! Now what? Well, I won’t go into the details of driving the wrong way up a one way three lane street, nor the narrow missing of a huge boulder rolling down the hill and landing on the other side of the garage where we parked the van for safekeeping for a few weeks. We’ll start the story as we head north with our new acquisition. Pandas also need names. Not entirely sure what panda’s history is but he (she?) came with the van. On the way north we stopped for coffee with the rellies. They had a tour of the van and when William asked what Panda’s name was, we asked him to do the naming honours. Pete it was. Pete the Panda. Apart from the coffee detour we also had a whiskey detour. Who would have imagined a whisky distillery in the middle of suburban Kaiapoi? We didn’t, but it would have been rude not to have called in! And even ruder not to have bought any! The Kaikoura coast really has been decimated. In 2016, it was the centre of a magnitude 7.8 earthquake which pretty much cut the place off. Subsequent ‘weather events’ have undone some of the remedial work that was done on the roads and when we drove north, it had just been re-opened, albeit with a curfew. Access was only in daylight hours, – 7 am to 7pm. The landslides and the damage to the road and coastline are incredible and progress is slow with lots of the road operating one way only with traffic lights or Stop Go signs. It has been difficult to imagine what the road looked like from the constant news articles, and I think that it is worse than we ever thought. We stopped at Kaikoura itself for a break and a wander along the seal colony. It is 13 years since I was last there and so memories are a little hazy. But we saw plenty of seals basking like large slugs in the sunshine. However, there is evidence of the earthquake apart from the obvious shift of the level of the coastline. In one section of the trail, we noticed skeletons of young seabirds, in situ, seemingly in nests. It was quite eerie. We have struggled to find any documentation specifically and it may well be that these are victims of a weather event subsequent to the earthquake. As 7pm drew close, we needed to make it off the road. 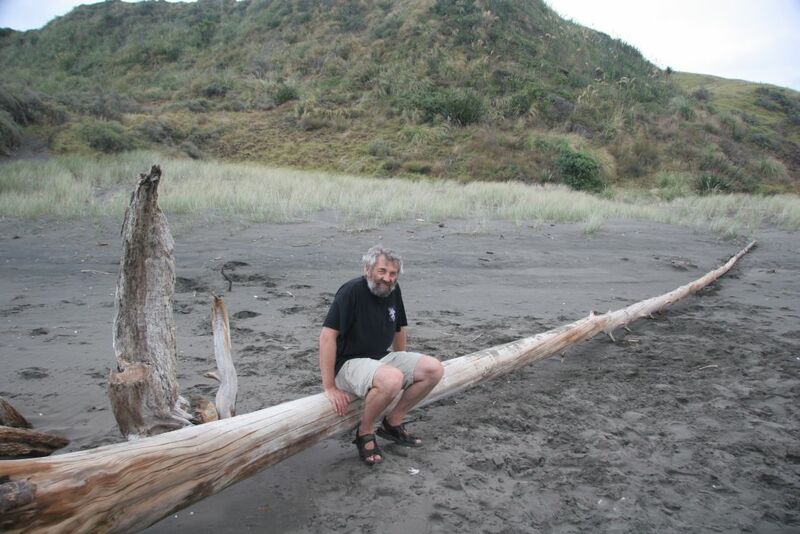 The NZ Campervan Association manual told us that there were several possible overnight campsites along the road. Unfortunately, it didn’t tell us that they were no longer available because of the damage to the road. Maybe because the NZ campervan association is almost entirely analogue and so can’t easily update. However, eyes peeled we scanned the coastline and soon saw the telltale white of another van parked up close to the beach. The railway track was now conveniently on our left and so we easily pulled off, followed our noses and found a sweet spot right on the beach. We nudged Vera backwards so that we could open the tailgate and have a view of the ocean. Set for the night. So we’re settled into our new house, started to get to grips with the garden – even bought some plants, a shredder to mulch the prunings and the falling autumn leaves. We have plans to create a veggie plot and swap some of the decorative perennials for fruit trees. Aonghas has already planted some carrots and marigolds ( or marlegods as he calls them!) in the boxes outside his window. The early Camellias are starting to flower and we have a carpet of deep pink petals in our garden. Roses are still blooming but the trees are wearing their autumnal colours and looking glorious in rich shades of yellow through orange to red. We were down in Rotorua as I was taking part in a Duathlon, we decided to make a weekend of it as it was the last weekend of the Easter holidays, and our friends Liz and Chaz were also there with their boys, Jamie and Josh. Liz was competing in the Duathlon too, as well as a couple more of our friends. We stayed in the Thermal Holiday park – the same one we stayed in when we were here on holiday in 2005. We rented a self contained unit which, in estate agent speak, made good use of space – compact and bijou! The advantage of the park are the hot pools, plenty of running around space for energetic boys, a games room as well as a television! After a couple of weeks of glorious weather we had a weekend of rain and wind, so the going was soft and muddy! We set off with the wind and rain lashing our faces, but once on the way and into the forest, we soon warmed up. The pressure was off as far as times go because of the weather conditions so we just relaxed and went with the flow. Obviously a good move because I ended up with a time 5 minutes faster than the last duathlon I did and a top 10 finish! We hung around in the cold and wet for the spot prizes because you never know ……. that $2000 bike might just have your name on it! Sadly it wasn’t to be..maybe next time! But, boy were those hot pools good when we got back to the holiday park! A couple of hours later and nicely coddled we emerged to head back home! We stopped off at what has become a bit of a regular, favourite spot for us – the Fat Dog cafe. Huge portions of scrummy food and plenty of veggie options for Nigel. Heaps of sald with home made burgers as well as BLATs, fries, wedges ….mmm, my mouth is watering just thinking of it! Well the boys have made it through to the end of their first term at school. Lachlan seems to be coasting quite a bit and finding the standard of the work easier than in the UK. Of course he doesn’t mind not having much homework because he finishes everything in class but has intimated that he finds some of his lessons boring because he isn’t really challenged. He is also still quite disorganised – lost his school planner already so doesn’t write anything down (not that he used it anyway!) Whilst he doesn’t have much to remember it’s not a problem but he isn’t getting into the habit of using a planner for when he will have more to remember. (Sorry QES but the good habits he was encouraged to have there have just gone out of the window now there is no pressure from school here!) There is a Parents’ evening after the holidays so we will address those issues then! It may just be the case that the first term is slow because all the students are new and have just come from the different Middle Schools. However having started to study the French scheme of work in readiness for my new job I think it’s more the case that the standard here is just lower than in the UK! There has also been quite a lot of discussion in the staffroom about the low standard of the NCEAs, (external National Exams) which were introduced/revamped relatively recently, being too easy. The idea being that everyone succeeds and so has higher self esteem – where have I heard that before?! The reality, of course being that most kids find them too easy, aren’t challenged and so just doss around in class because they know they can gain credits without putting themselves out too much! Balance is a wonderful thing! That, of course is a crassly simplistic explanation of a complicated educational ethos but one that, I think, has some merit. Aonghas is enjoying school (though claims he doesn’t as always!) and he is positively challenged. A balance does seem to be achieved in the Primary School although if we had any complaints it would be that he has too much homework! He certainly has a more structured program than Lachlan and spends more time “studying” at home. They have a program called “Have a BALL” (Be a Life Learner). They have a grid of activities that they should do over a two week period which include maths, spellings and reading, as you would expect, but also has activities that involve the whole family in an attempt to encourage parents to take some responsibility for their children’s progress and also to create a healthy work-life balance. Activities include doing a 10 minute task to help out in the house each day (fine by me! ), playing a game with a family member, trying out a new activity, relaxing (he’s good at that one! ), doing some exercise, using a computer to do research work and so on. All activities which you would expect to do in your everyday life. In theory the children do the activities at their own level but Aonghas does get quite anxious and thinks he has to complete everything so we have had some tears! 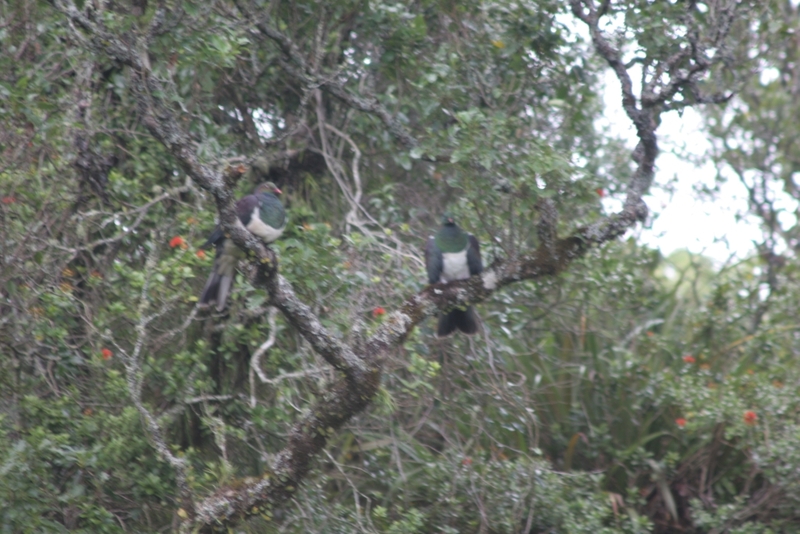 The two week blocks tend to be topic related and obviously linked to the topics they are doing in school so last time all the work was to do with birds as they have just had a trip to Maungatautari. For example, there was some research to do about how fantails build their nests, they had to draw a bird and write some notes about their chosen bird, they had a poem as a stimulus and had to write a similar poem about a bird of their choice – all that on top of 10 minutes reading everyday, learning spellings and maths activities! Quite a lot of work and in fact there was some discussion in the playground from other parents about how much there was and how much time parents as well as children were having to spend doing it. Aonghas is quite bright and relatively well motivated – surprisingly! He comes home most evenings and gets his maths book out to complete his maths, though he is less keen on writing activities. We also have time to sit with him but families where the children are less bright or who have little brothers and sisters and parents don’t have the time to sit with them are finding the whole program quite onerous and stressful. Anyway, they have a break over the holidays – all the activities on the homework sheet are just having fun, eating healthily, helping round the house, and doing physical activities to challenge themselves. We can cope with all of those! One of them is to climb your nearest mountain so hopefully we will get out this weekend and do that! We have a few to choose from! 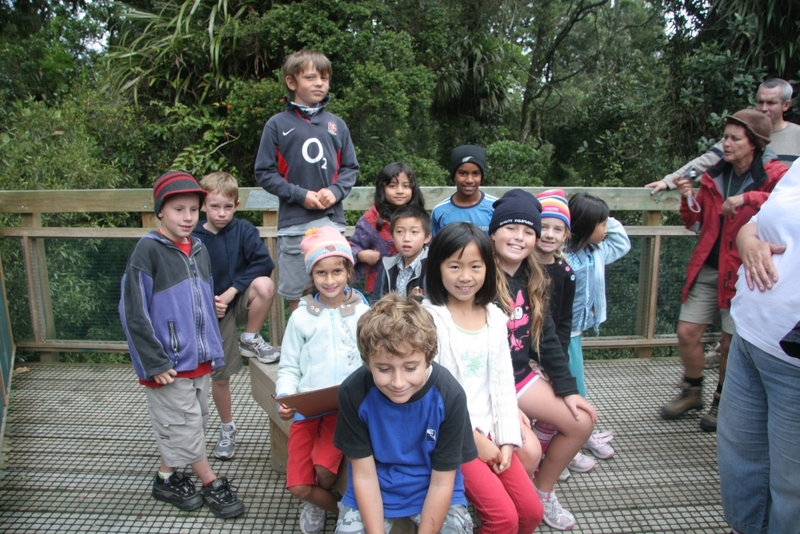 I mentioned Aonghas’ school trip to Maungatautari – Maunga is the Maori word for mountain. Aonghas was delighted that I could accompany him and his class – he has always wanted me to come on school trips and I never could before because I was working full time. Maungatautari is a forested volcanic cone which unfortunately over the last 200 hundred years or so since the European settlers arrived has been decimated of it’s native species – both plants and birds. This is a huge problem all over NZ. The threatened native populations of NZ are mainly ground dwelling birds such as the Kiwi which had no predators until the early settlers introduced rabbits, and then stoats, weasels (to control the rabbits), mice, rats, possums, goats etc. 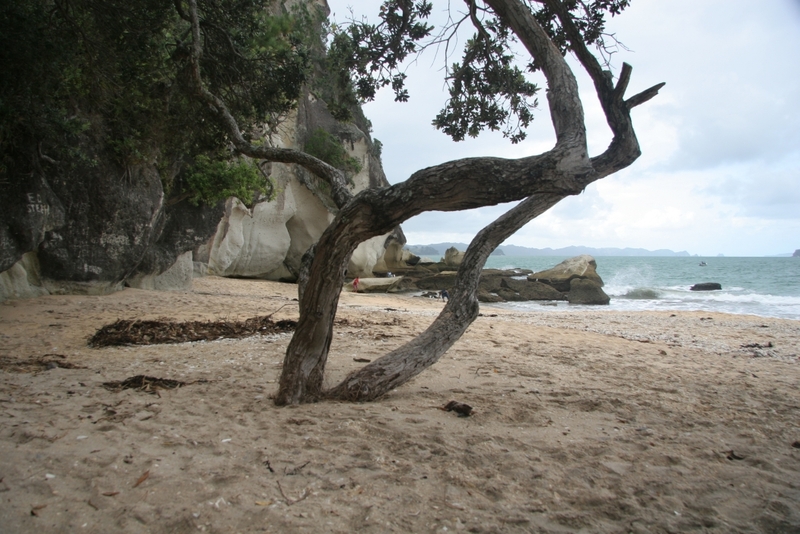 The trees were felled, especially the Kauri, for building which inevitably affected other species in the bush. 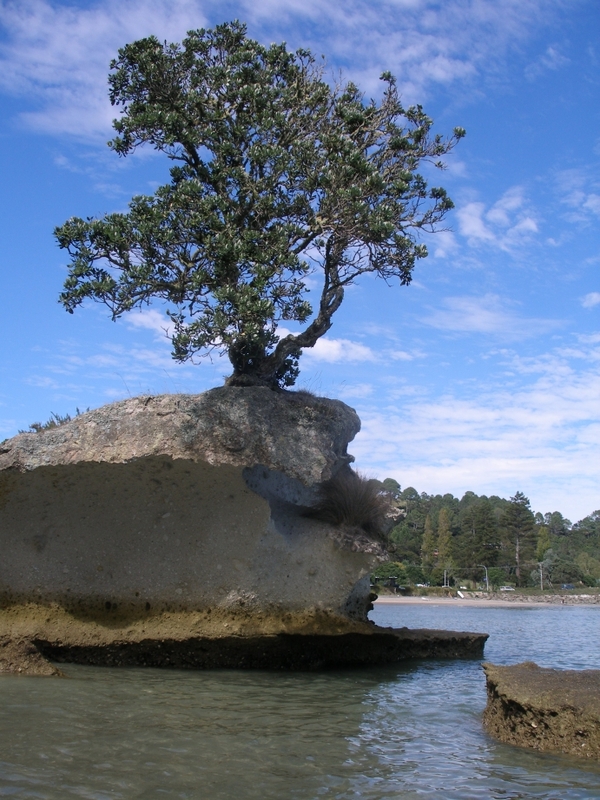 Anyway the upshot of it is that the Department of Conservation has created an Ecological Island at Maungatautari. 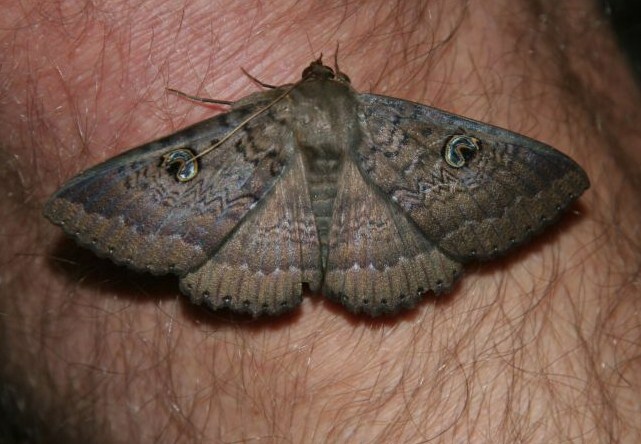 It is an amazingly ambitious project to clear the area of all mammalian pests and predators (non-native species) and to encourage native species such as the kiwi and other birds as well as regenerating a healthy diversity of fauna and flora in the forest. To that end they have erected a predator proof fence around the whole area and spent years tracking and trapping all the predators from within the area so that they now are pretty certain there are no predators left. In the last couple of years they have introduced several pairs of kiwi as well as other birds and just this year a kiwi chick hatched. The fence really is impressive – there is a space like a sort of no mans land either side of the fence so that creatures can’t use the tree branches as bridges and there is an alarm system in place in case the fence is breached by, for instance, a tree falling. We had a lovely time – there were 5 parents as well as two teachers so we had responsibility for a group of 4 children each and of course Aonghas was in my group which he was thrilled about. 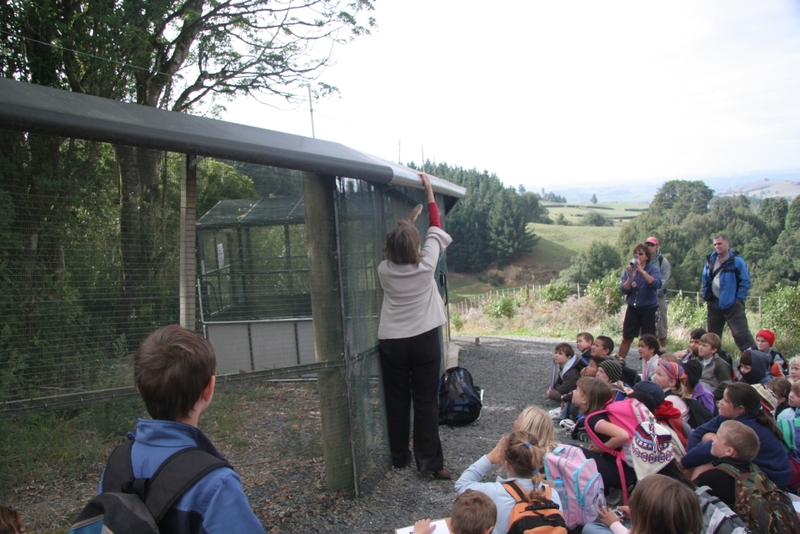 We met a volunteer from the Maungatautari Trust who told us all about the aims of the project and then took us up to the fence and explained how it worked. The children had already done some work on the project in class so knew some of the information which meant that they didn’t have to take in too much at once and were able to ask really good questions and answer her questions too. We then walked through the forest and tried to keep the children quiet enough to hear the birds! We spotted lots of the predator tracking boxes – these are placed every 20 metres or so throughout the forest so that they can make an accurate survey of what is around. 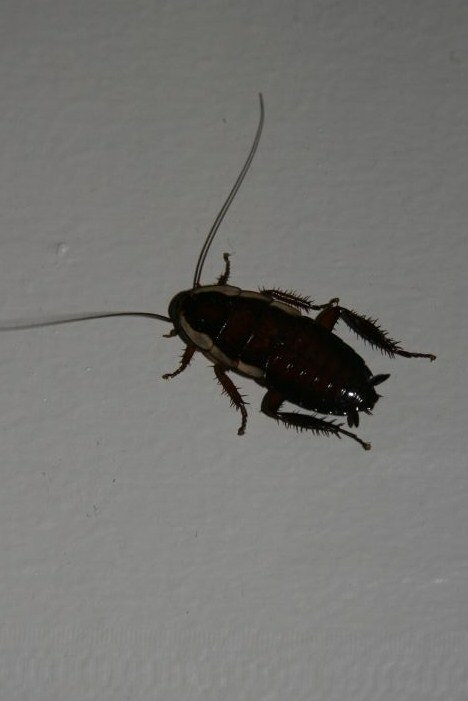 Even though they are pretty certain hey have eradicated the pests they continue the survey to make sure none get in. Just yesterday there was news that on a similar ecological island in the Hauraki Gulf a predator has killed some birds so vigilance is vital. 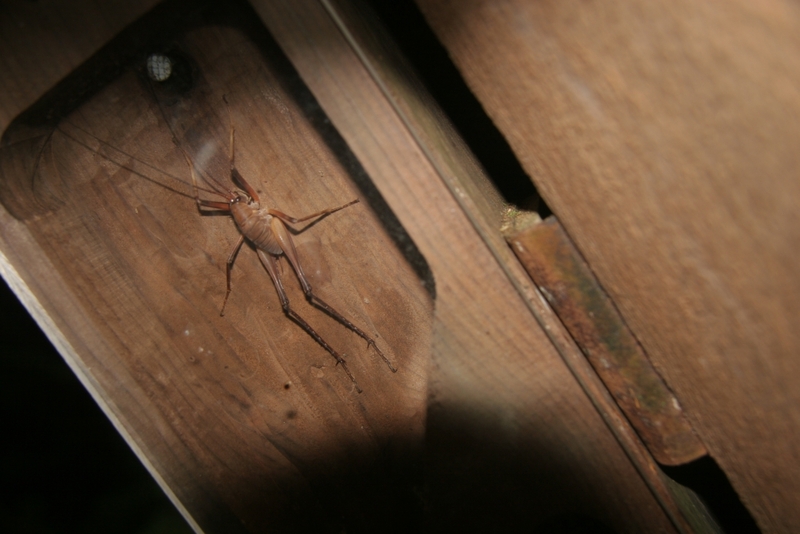 There are Weta houses dotted around the forest too which gave us an opportunity to see these normally nocturnal spiders. The best part of the walk was when we were entertained by a very cheeky little Fantail. These are delightful wee birds which flit around from branch to branch, chirping as they go and this one led us a real dance! I’ve included a short video I shot on our camera – not very high spec and definitely not professional quality but hopefully you can get an idea of what we saw. Fantails are quite tame and have been known to come in to people’s houses. This is the poem that Aonghas wrote for his homework (with some parental help – but not much!) about the Fantail. I’m never still, always in a rush. My black and white stripy tail bobs up and down. Scratching under my wing and squeaking as I go. 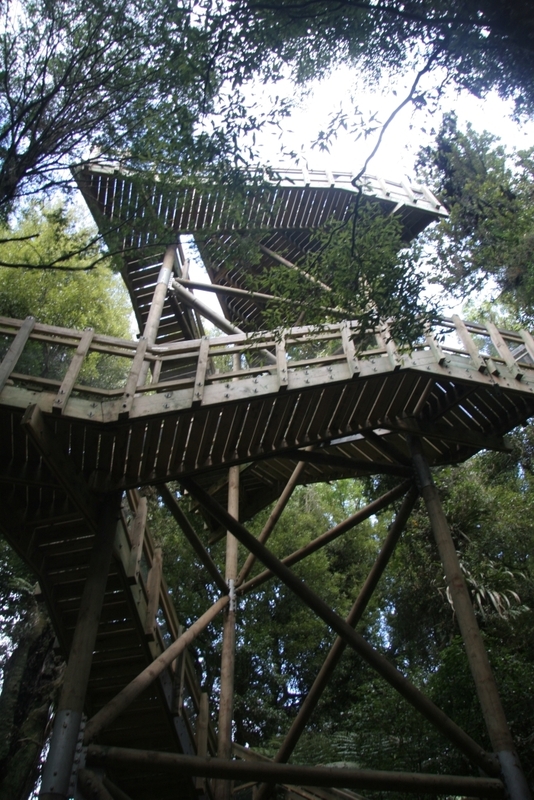 In the middle of the bush there is a wooden tower which the kids had been talking about the whole trip and it didn’t disappoint. It is a huge structure which is pretty impressive, it sways in the wind and as it is wood it also creaks but the view from the top is stunning. You can look down on the birds’ nests and the crowns of the trees and we had a great view of a couple of very fat looking Wood Pigeons. Unfortunately the sway of the tower added to the number of children running round the top platform and the distance means that the photos are not the sharpest but you get an idea. If you ask Aonghas and half the kids what the highlight of the trip was though they would say it was that one of the buses broke down on the way back and they got to play on the playground whilst they waited for it to be fixed! Back to work and school after a short break at the ocean. Wow! 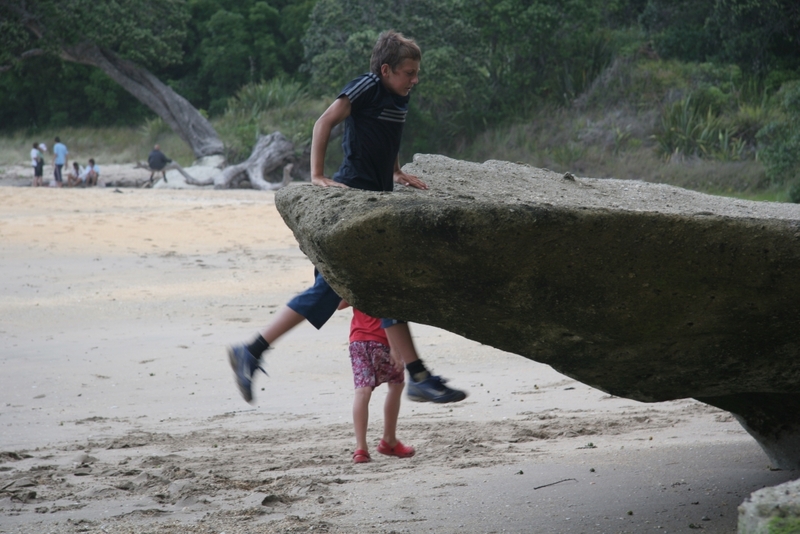 We headed up to the Coromandel over the Easter holidays – just a 5 day break here as there are 4 equal (ish) length school terms. Great to have an extended weekend in the middle of the term though. 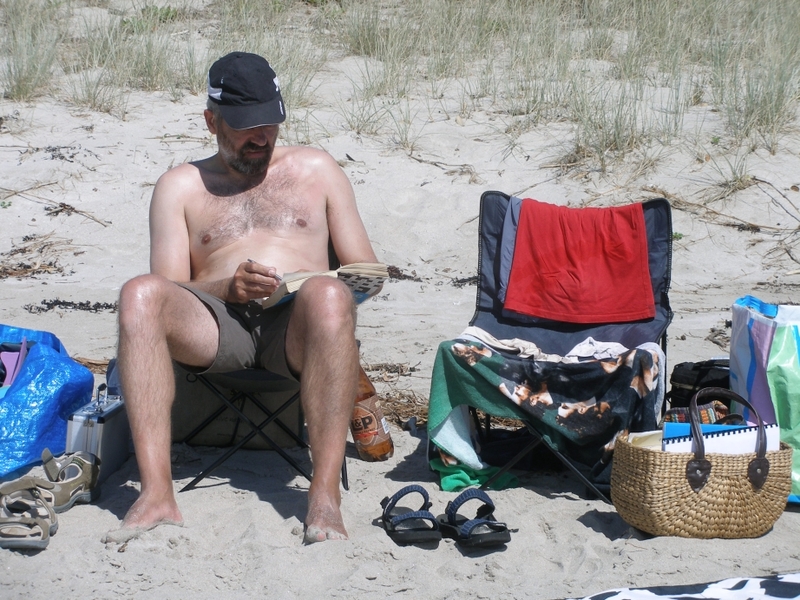 We went straight up to Cook’s Beach on Thursday after work and put up the tent in the dark! Went to bed with the Morepork serenading us and the trill of cicadas ringing in our ears! After a relaxed start to the day we went off to the beach where we had an idyllic time body boarding, diving through the waves and generally doing what you do on a beach. The weather was glorious and Nigel ended up looking a bit like a lobster by the end of the day despite having slopped sun block all over whereas Lachlan just looks even more like a native! (Pleased to say that the redness has gone down and Nige is looking a healthy brown now!) 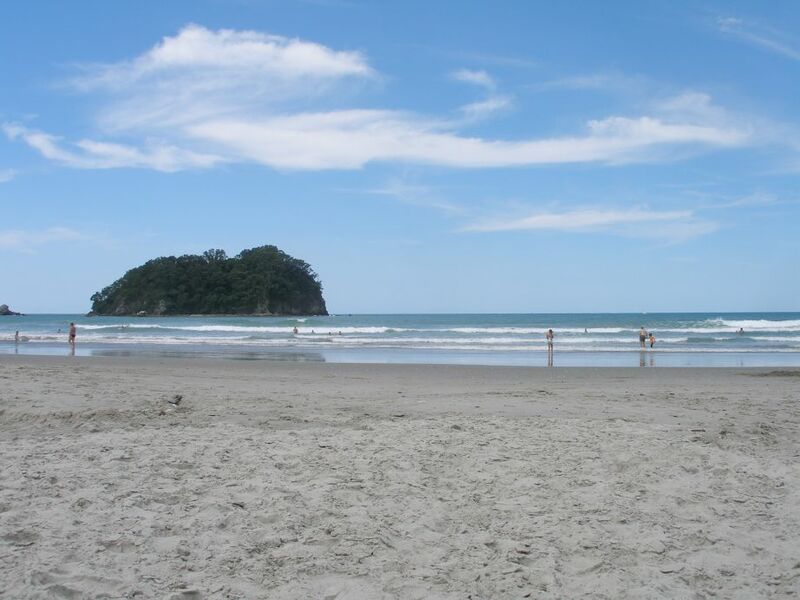 Cook’s Bay is holiday home mecca – most of the people we have met in Hamilton have a “Bach” somewhere along the Coromandel coast – there are some fantastic properties and loads of sections being developed for sale. However there are also some very simple almost caravan type baches – just a place to sleep in between sailing and surfing. Very tempting! 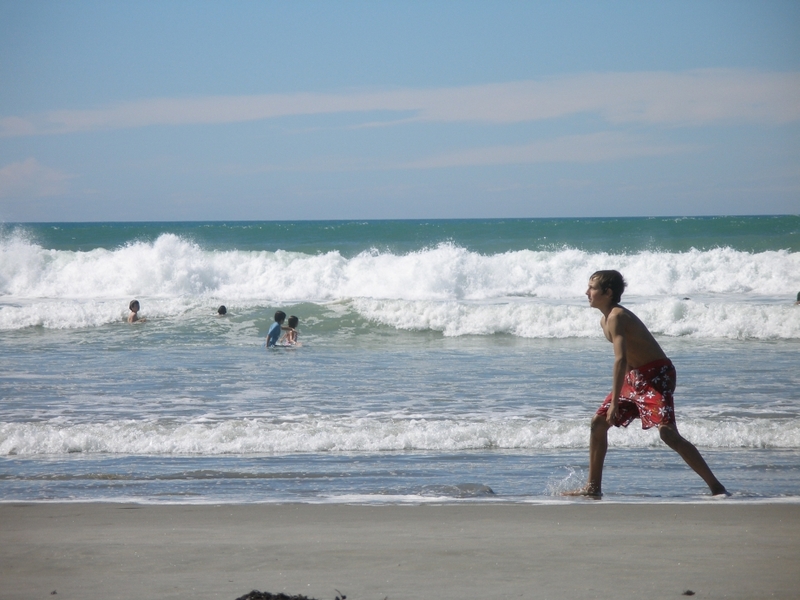 On Saturday we decided to try Flaxmill Bay – just 5 mins North of Cook’s Beach. 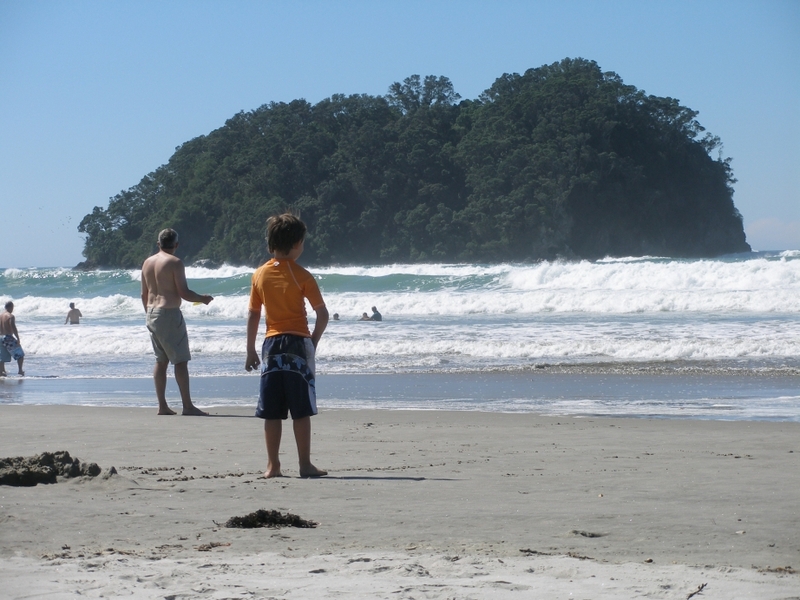 The boys were initially disappointed as it is a much more sheltered bay with little in the way of surf. However we planted ourselves by the stream flowing into the sea by the cliff edge and found we could wade out and round a corner to some large rocks and little bays. It really was beautiful and we could swim/wade through the channels between the large rocks and explore. It was a bit like above ground caving! The boys decided that it was a great adventure and had a lovely time pottering about. I went back for the camera and Aonghas persuaded Nigel to come too as you could wade most of it! The tide was going out fast and the water was barely knee deep most of the way by now. What a lovely place to swim and relax and just nose around! In the evening we went over to Whitianga on the ferry from Ferry Landing to go to the Blues Festival. We had read on the website that no “professional” cameras were allowed so didn’t take the SLR and big lens, it also stated that no food or drink was to be taken into the area as there would be traders. However nobody checked our bags and then we found out that you had to buy tokens for beer and you had to buy a minimum of ten tokens at $3 each! (it cost 1 token for a beer!) Since we had to drive back we were a bit disgruntled that you couldn’t buy single units. Anyway it transpired that the beer came in cans so we decided that whatever we didn’t drink we could take back with us! Found some food – not a wide choice but it kept the boys happy and settled down to listen to some music. Keb Mo was playing on the main stage when we arrived and he was pretty good. He was followed by KT Tunstall who was great – very natural, and Aonghas was amazed that someone he has heard on a CD actually exists as a real person and he just stood and watched in awe! He joined in all the songs he knew singing loudly and enthusiastically. There was a bit of a wait then as the stage was rearranged for Ian Brown, by this time it was nearly 10pm and the boys were getting tired. They both curled up and went to sleep during what personally I thought was a pretty uninspiring set. 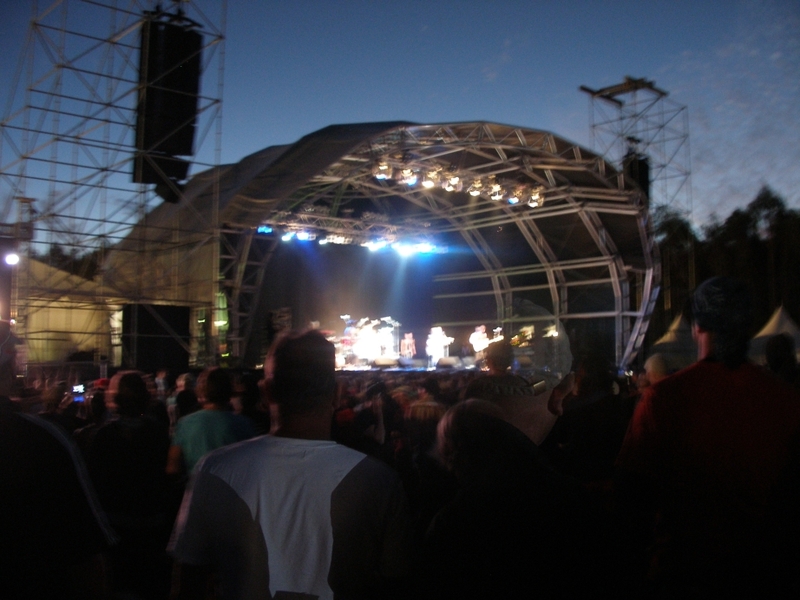 Buddy Guy was the main reason we had decided we had to go up to the Coromandel this weekend and it was well worth the wait. He eventually came on stage at 11 o’clock -ish and just blew everyone away. Awesome! We woke the boys up and though still sleepy they enjoyed the music and the performance too. I tried to take some video with sound with my mobile phone – you get an idea of the atmosphere but the quality is pretty bad! What an amazing guy, so much energy and stage presence and just sheer skill. His “duels” with the pianist were exceptional and being able to see it on a big screen as well as on the stage meant that you could see all his facial expressions and the fingerwork on the piano. At the end of the show we made our way back through the throng to get the shuttle bus to the ferry and finally got back to the tent in the early hours tired but happy! The weather turned overnight and Sunday was a bit cooler and cloudier, a few showers broke the day up so we took advantage of the change in temperature to go for a bit of a walk. 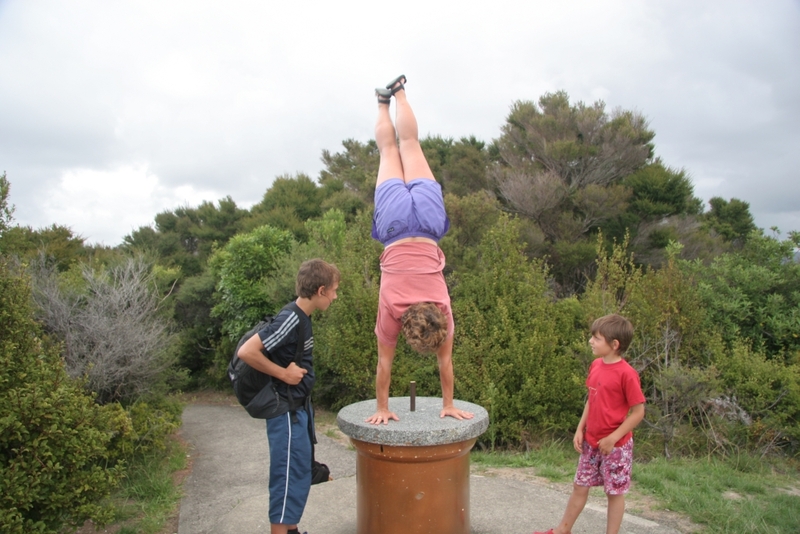 We went back to Flaxmill Bay to walk over Shakespeare Cliff. A pleasant walk through the bush up to a vantage point marked with a trig point and a stone marking the landing of Captain Cook in HMS Endeavour. We then walked down a track to the beautiful Lonely Bay. 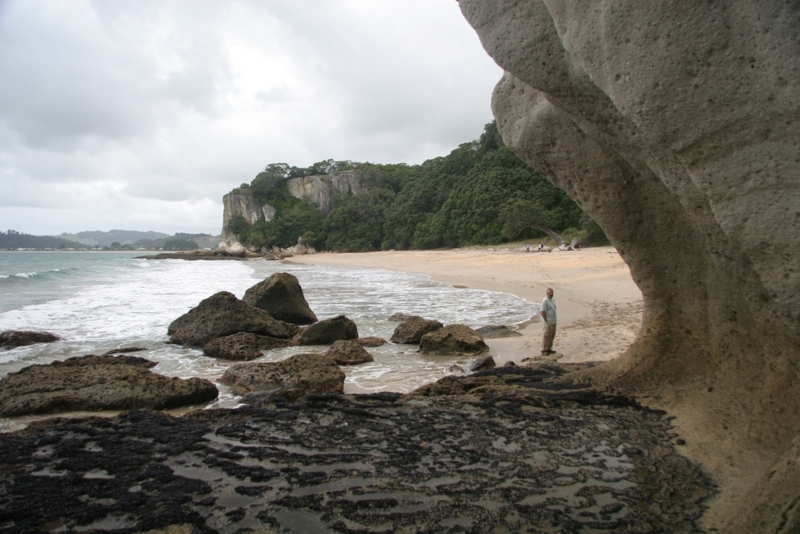 An isolated little sandy crescent shaped beach with huge rocks, rock pools, sea caves and arches. 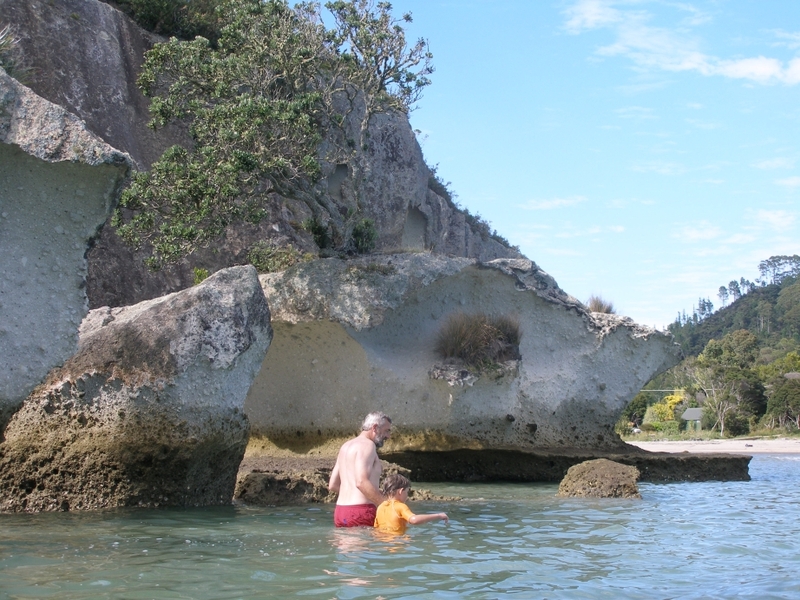 A brilliant place to explore; we paddled in the sea, climbed over and through rocks, swung on tree branches, explored the rock pools and the caves and I delighted in the array of shells which abounded. 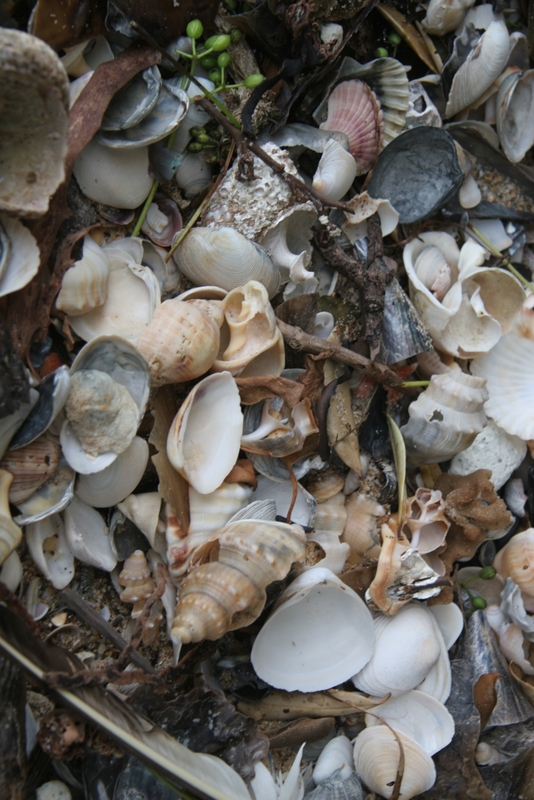 I spent quite a long time rearranging shells, seaweed and pebbles to create Goldsworthy-esque pictures in the sand – very satisfying! 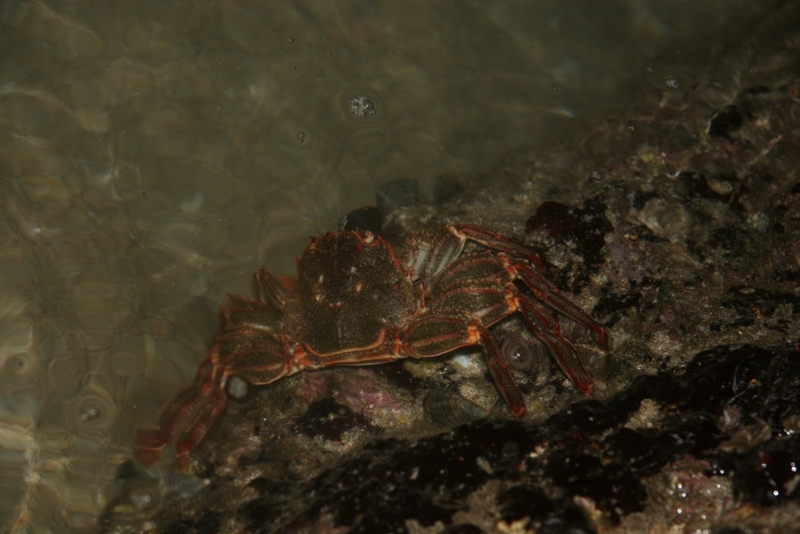 Then I realised that the boys and Nigel had disappeared so chased after them to the rock pools where I was startled by the scurrying and scuttling of a couple of large red crabs! Managed to get a couple of shots of them and then realised that they were everywhere! They were being washed into the spaces under the rocks by the sea and then finding their way into the crevices ntil the tide came back in to let them back out to sea. Caught up with the boys and told them what I’d found and we all went back to be fascinated by them – all sizes from tiny little ones to others twice the size of your hand! Some had yellow spots and some were red and some had stripes – really beautiful! Once back at the car we decided to go for a coffee in a cafe called Eggcentric – it had a good write up in the Rough Guide. Lovely cakes and as the book said a quirky setting – some impressive sculptures decorate the gardens and the restaurant itself but we weren’t impressed with the service. To be fair we arrived as they were setting up for the evening session (about 5pm) but it was no excuse for their rather rude and unfriendly manner. Probably won’t go back! We packed up on Monday morning and set off for home stopping on the way at a place called Onemana. Very posh holiday home spot – we’d decided on there because Nigel had seen some photos on Flickr with that tag and thought it looked nice. Turned out the photos he’d seen were of another beach just down the coast from there! 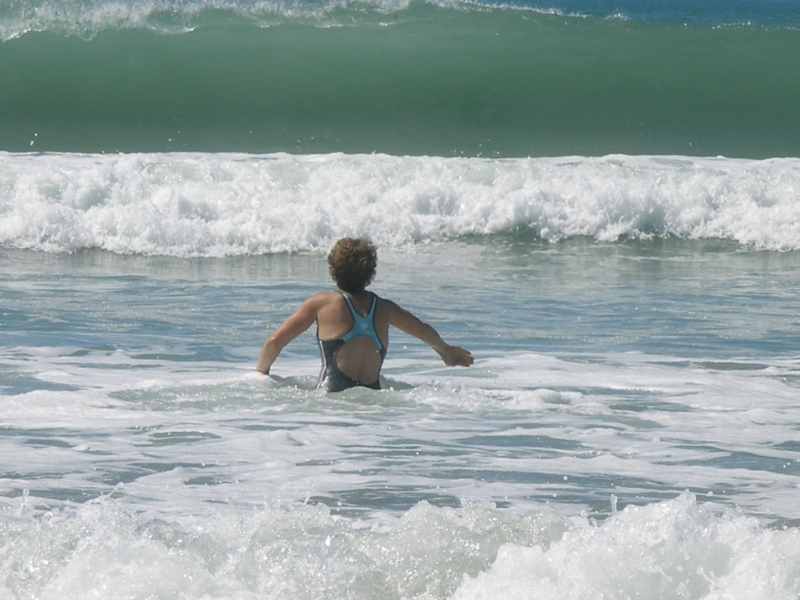 Nevertheless we had a pleasant afternoon playing in the sea – big waves and quite a strong current. There was only a small area which was safe to swim in as there is a dangerous rip. The murk of the morning had passed and once again we basked in the sunshine. 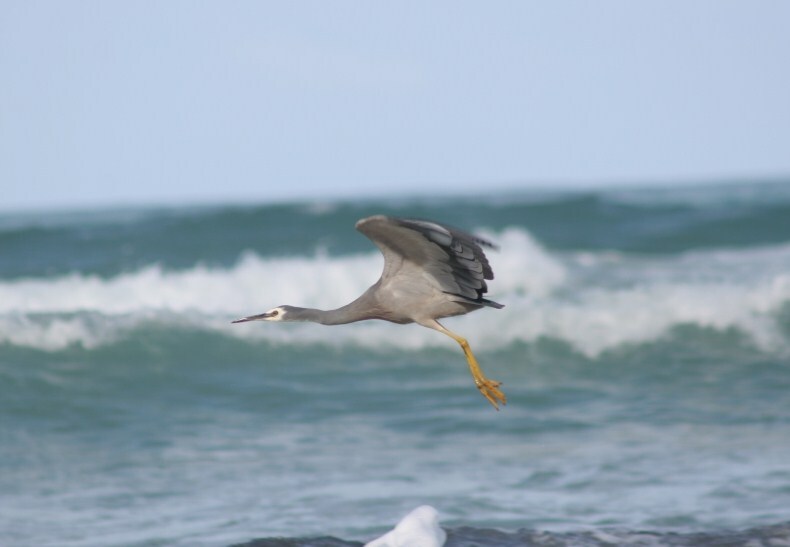 Whilst we were enjoying playing in the ocean Nigel went for a stroll along the beach and took some brilliant pictures of the sea birds. 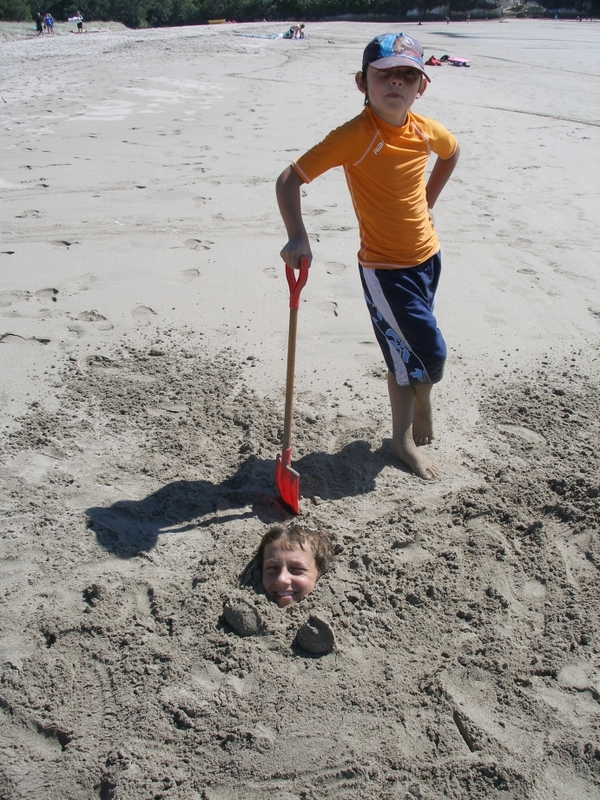 When the boys tired of the sea they dug a castle with impressive sea defences to keep the encroaching waves out! 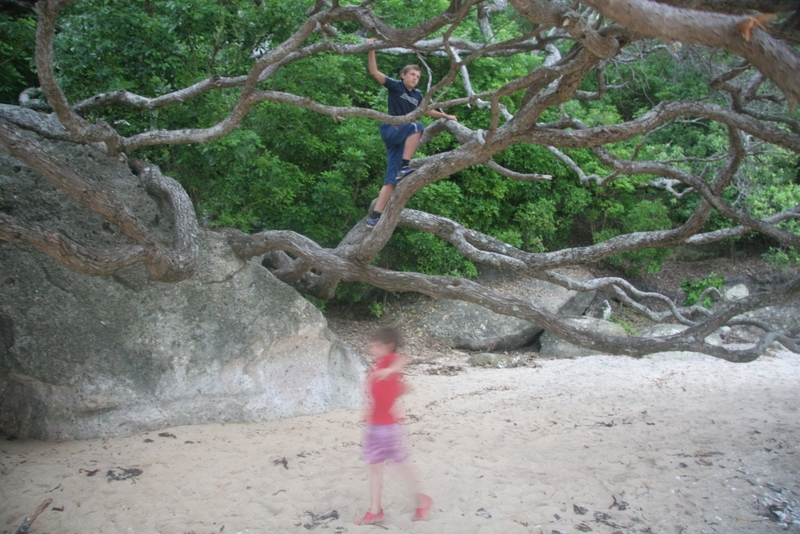 It didn’t last though – another lesson learnt about the power of nature! Well, the inevitable has happened – my relaxing, work free lifestyle is drawing to a close! This week I did my first three days relief work at Hillcrest High School and have another week booked in a fortnight’s time. I have also submitted an application for a maternity leave contract at the same place. It will be for 3 terms starting 5th May if I get it. Hillcrest is the school that Lachlan is going to though I haven’t had him in a class yet. My first class was a boys Year 11 PE group – apart from the multicultural element they were no different to a Year 11 boys PE group at QES, well, why should you expect anything different – boys are boys the world over! Pleasant, lots of banter, worked hard on the whole, a couple who tried it on (I had to confiscate a plastic cutlass that one boy had brought in and then hidden down his shorts!!) And in the adjoining gym another relief teacher had the girls – reluctant on the whole to do anything, PE kit issues, needed lots of chivvying! I know which I prefer! The staff all seem friendly and helpful, though there is little in the way of induction, I have had no tour of the school or “package” which explains any of the workings of the school etc – just straight in! Anyway, armed with a map and a board marker, off I went! By Friday afternoon I felt like I’d been there forever! Found the ex-pat contingency – there are two other Tykes working in the school so we had a bit of a “Yorkshire” reunion! Also managed to find the end of the week drinkers – Friday 3.30 and the bar in the staffroom opened for business! No work booked for this week yet but the phone could ring at any time…! Another win for the Hillcrest Smashers (Aonghas’ cricket team) this Friday, that’s 3 wins out of 4. Aonghas is not a natural cricketer. it has to be said, but enjoys being part of the team. Might try and do some practice over the next week to help him improve his skills! 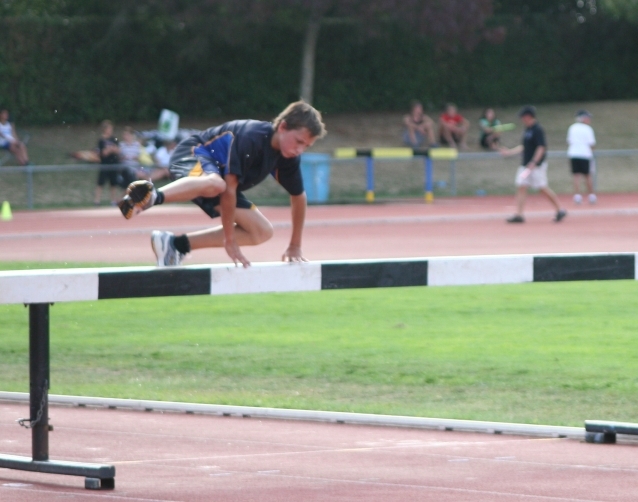 Lachlan competed in the 2000m Steeplechase on Saturday afternoon at the Waikato & Bay of Plenty Championships – he went straight through to the Regional Champs after coming 2nd in his school sports because as there are not many entrants for the event it isn’t run at the Zones. 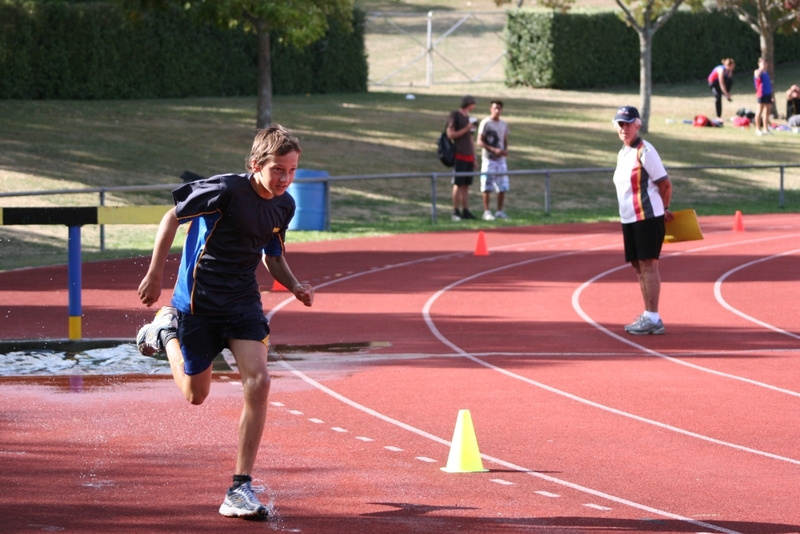 He was realistic about his chances as it was an open race against students of all ages up to Sixth Form. Indeed, he came last but he ran a PB and it was good experience! It is only the 4th time he has run that distance in a race and only his 2nd Steeplechase, so we think he did brilliantly – as it was an open race the hurdles were at full height which meant he had to vault them! And it’s a long drop off the water jump! Well, as Nigel said in an earlier post we have bought a car which has made managing our busy after school activities a lot easier! The only problem is remembering not to switch the windscreen wipers on when you want to turn left or right! It’s also a bit weird not having a clutch and a gear stick – my left hand and foot seem rather redundant! The “gear” lever is on a stalk on the steering column just above the windscreen wiper stalk so it has been used on countless occasions despite the sunny weather!! Nevertheless I am getting used to it now and it was quite exciting doing my first “big” supermarket shop! How sad is that? I have started my Maori class – I had wanted to learn Japanese so I could help Lachlan when he starts learning at school but couldn’t find a class on a bus route! So I decided to find out a bit more about the Maori language and culture and have my second class tonight. It was really interesting last week especially looking at the mix of people in the class. Quite a few NZ Europeans who were learning it because they are finding that they are involved with the Maori community as part of their work. A few like me who have moved to NZ from elsewhere and just want to find out more about the culture and language And then several young-ish people of Maori origin who don’t speak Maori. They feel embarrassed that they can’t help their children who are learning Maori at school and are asking them to help them. The teacher is lovely and the lesson is a really good mixture of cultural information and language. Lachlan competed in his school sports day and despite missing his first race because the school bus was late (!) he went on to come second in both the 80m hurdles and the 2000m steeplechase. That means that he has been selected to go through to the Zone Champs and will compete against the best of all the other kids in the Zone on Wednesday at Porritt Stadium. He seems to be enjoying his athletics at the moment and has been going to Porritt to the Hamilton Hawks training sessions on a Thursday evening which is quite daunting as there are “real” athletes there! He has learnt how to use starting blocks and ran in a 200m race last week and didn’t seem to be fazed at all by the other, very experienced and very fast competitors! Most of them were much older than him – in fact the age range seemed to go from 13 years (Lachlan) up to someone in their mid-40s! The weather has been more unsettled recently but it is still very hot. There has been a bit of rain to moisten the ground but not enough according to the farmers who want another 10cms! Apparently it is needed as all the farmers are losing money, milk production is down as they are down to one milking a day. And apparently the ewes are ready to tup but are underweight so that will have an impact on lambing! It’s amazing what you learn from Radio NZ! Did you also know that “marble” type sheep poo is much healthier than “ploppy” poo as there is less chance of diseases being passed on across the flock?! I think I need to get out more! 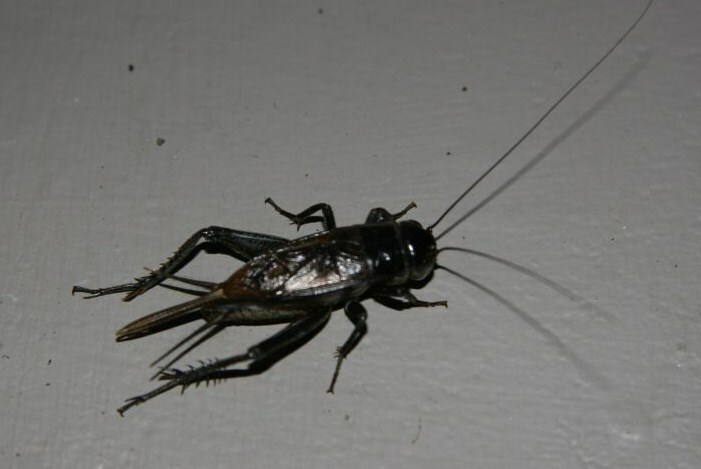 Lots of insects about as well – Aonghas is getting better about them and we don’t hear him shrieking quite so often now! We got a “What’s that NZ insect?” book out of the library so are trying to focus his attention on identification to conquer his fears. I was bitten to distraction by some wee voracious biting beasties whilst I was digging up the bindweed from the garden to clear a patch to grow some vegetables. Still itching like mad a week later with large red patches all over my arms and legs – antihistamine seems to have no effect anymore, nor does lavender oil though it does smell nicer! Any suggestions gratefully received! Any way, after a generally fine and hot week, a wet, rainy Saturday dawned. Great! The kids actually seemed quite happy to play in Aonghas’ den – his bed has finally arrived so he was enjoying creating a den underneath it! However we knew it wouldn’t last so despite the rain we decided to go for a “drive! ” Bit of a standing joke in our house because as children both Nigel and I were subject to “Sunday drives” in the country and hated them!! Well that’s what people did, isn’t it – invisible umbilical cord people – out for a Sunday drive and get the picnic out on the side of the road! Actually, to be fair, my Dad wouldn’t have been seen dead doing that and we did usually go for a walk somewhere. But it’s the fact that you were dragged out when you were quite happy just chilling at home! 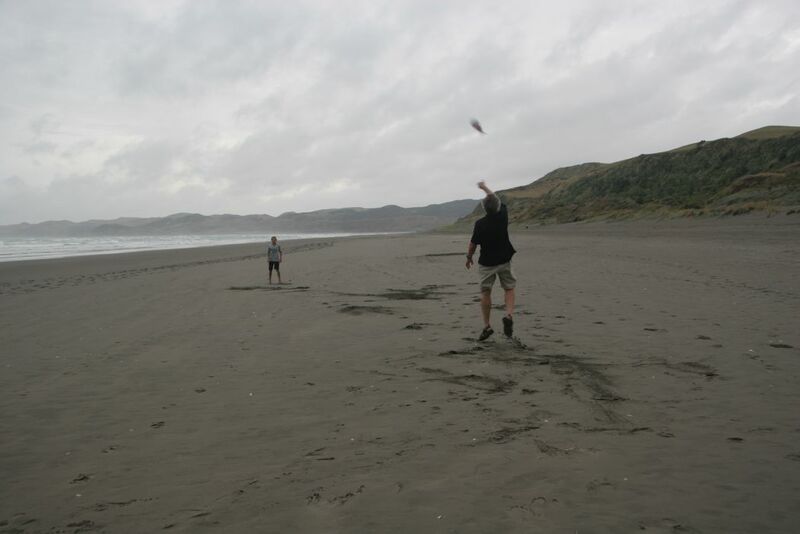 Anyway, we headed off with our cags, a rugby ball and a few snacks to Raglan. Unfortunately we didn’t pack our togs or any towels (had planned to but forgot), and as you might imagine, we got over there and it stopped raining! In spite of the grey clouds and the breeze, it wasn’t particularly cold and the boys would have quite happily played in the sea! 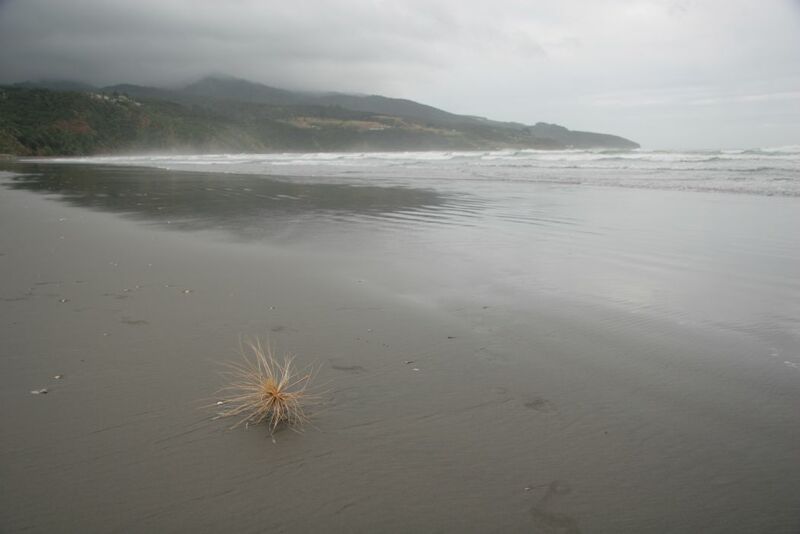 Never mind we played rugby and chucked the whistling ball about, wandered along the beach shell collecting and paddled in the (deceptively warm) Tasman. 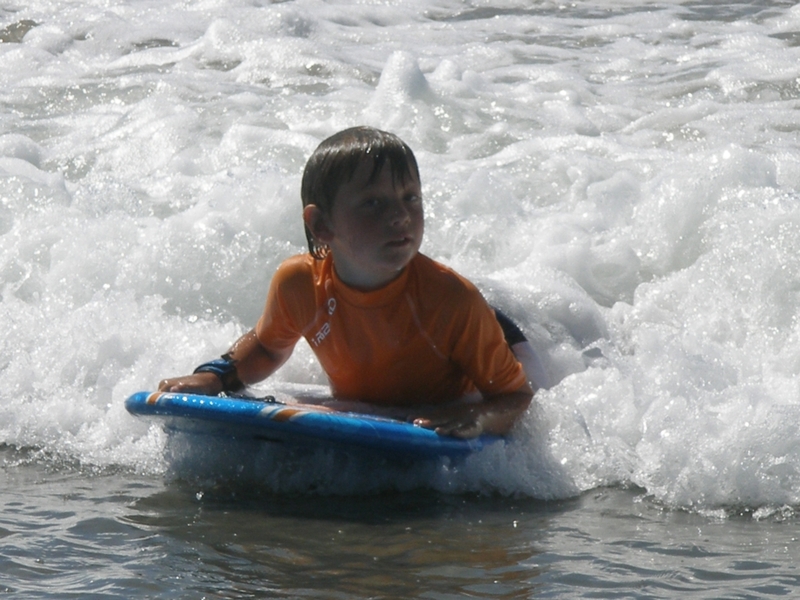 We also watched the surfers struggle in the waves. 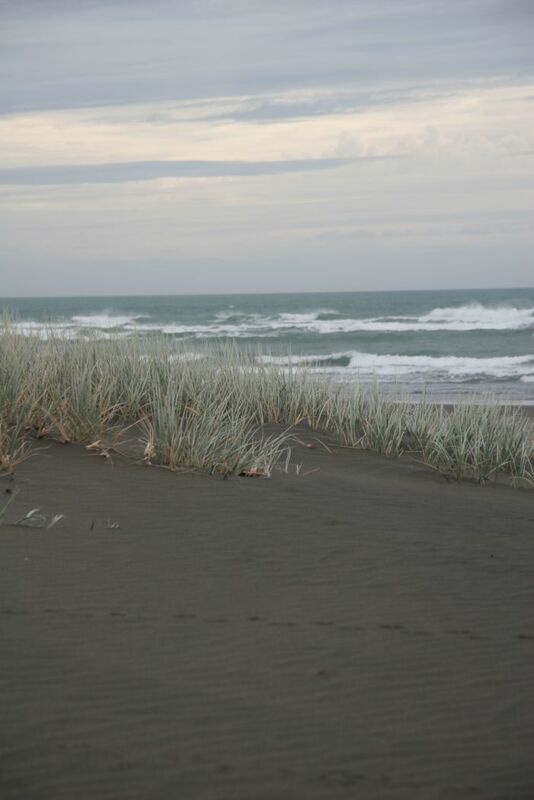 Raglan is supposed to have the best “left-hand break” in NZ but the waves seemed a bit broken up on Saturday. The breeze blew the cobwebs away and we had a lovely time, it’s only about 40 minutes away too so I think we shall be spending more time there. Sunday saw us at Marist Rugby Union Club to sign Aonghas up. There is a “weigh-in” at all the clubs in the area at the beginning of March wher you sign up for the club and have a “weigh-in”. That is because in NZ the teams are formed not just on age lines but also weight which seemed quite confusing. However being the mother of two smallish boys for their age it also seems quite reassuring that they will be playing against similar sized opponents rather than some of the “huge” lads they played against in England! The clubs, though, only have teams up to U13. 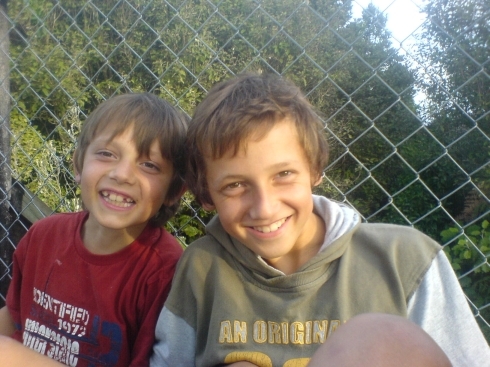 When they go to High school they play for the school and then go back to club rugby at U19. The other odd thing here is that, despite being a sport mad nation the kids effectively have to choose either rugby or soccer because everything happens on Saturday morning! Disappointing as our two are used to playing both but it’ll make our lives simpler!! Well an exciting week ahead as we have our first visitors arriving tomorrow and our container with all our furniture and stuff comes on Thursday. Will keep you all posted. Public holiday here and we drove to the east coast – about 90 minutes. 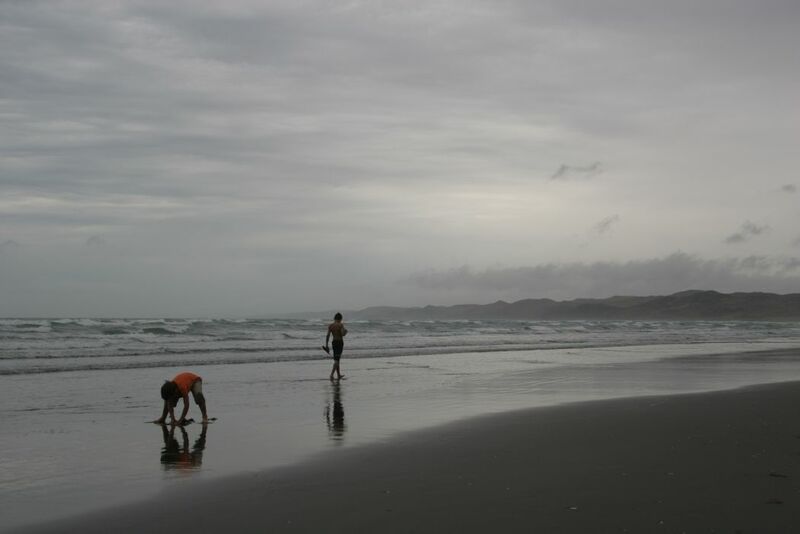 Beautiful white sands and nice rolling surf that is good to swim in without any great dangers. Certainly picked up some sun over the last 3 days – keep lathering on the factor 30.